When looking for the best method for plastic surface treatment, be sure to know the benefits of flame treatment systems. The nonporous surface of most plastic products makes bonding with outer coatings such as varnishes, laminates or screen printing impossible without pre-treating the plastic surface. Quality designed flame treatment systems provide surface treatment solutions with an effective and cost-efficient process. Flame treating plastic products is highly effective with instant alteration of the molecular structure of the plastic surface. Flame treatment machines provide an effective plastic surface treatment without visual alterations or damages to the plastic part. The instant exposure to a high heat flame is automated and efficient with the right flame treatment system, providing maximum cost savings when pre-treating plastic surfaces for improved adhesion. Automated flame treatment machines provide these benefits and more to deliver maximum value over other methods such as chemical pretreatment processes. Using chemicals to treat plastic surfaces requires purchasing, storing and disposing of harmful or toxic materials in addition to posing a health risk to employees. Flame treating provides a safe, effective and cost-saving method of pretreating plastic surfaces. Flame treatment of plastic surfaces is also a quality conscience method of plastic surface treatment options. Consistent exposure to a controlled flame provides a more reliable process over chemical application. The use of chemicals could result in an uneven application or evaporation which directly impacts product quality. Systematic Automation is committed to providing high tech equipment which works seamlessly together for your one stop automated solution. We help a multitude of industries worldwide to realize improved throughput, quality and profitability. We provide solutions with automated screen printing, painting, laminating, coating or bonding applications. Systematic Automation is dedicated to continual improvement, practicing research and development to deliver patented systems developed with proprietary technology. We offer a wide selection of screen printing machines for flat, cylindrical or odd shaped pieces with over two dozen models to choose from. Our experienced engineers partner with you to provide custom designed solutions that meet your specifications and exceed your expectations with virtually any screen printing, vacuum or flame treatment application. Systematic Automation has developed the revolutionary SA burner, a low cost gas burner head which provides an adjustable flame length of 2” to 10” with no tools required for simple flame adjustments. The specialized internal baffle delivers an equal mixture of gas and air to the hundreds of burner holes, which are precisely drilled into a high temperature aluminum alloy. Perfectly drilled, precision burner holes create the conical flame tip which provides optimum effect in treating plastics or glass. The revolutionary SA burner is featured in all flame treatment systems, which operate with either propane or natural gas with Pyrosil attachments available. This simple patented design fits all sizes with no tooling or manual adjustments necessary. The reliable Geneva Drive indexer provides long lasting performance with little to no maintenance required. The 100V variable speed brushless motor drives smooth dial motion for harmonic acceleration and deceleration. We design, engineer and manufacture this patented mechanical design featuring a simple overload clutch with no PLC controller to become obsolete. The Bottle Treater provides simple and efficient flame treating of bottles in an affordable system. Changeover is quick and easy taking only seconds, with hybrid systems incorporating UV curing an available option. Our patent pending 360° overall cure is achieved with rotating vacuum platens, providing complete surface treatment coverage. Systematic Automation offers pretreatment and posttreatment solutions, combined with high quality screen printing for your one stop automated solution. 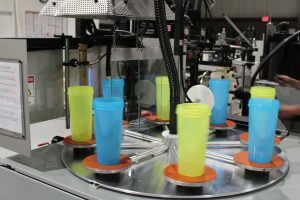 Systematic Automation provides added value with exceptional customer service and custom designed solutions straight from the leading manufacturer of screen printers, vacuum systems, UV curing and flame treatment machines. Be sure to consult with the automated specialists to realize maximum benefits with high quality equipment at an affordable price. Systematic Automation is the leading manufacturer of superior vacuum table systems, screen printing machines, UV curing equipment and flame treatment systems. All equipment is manufactured in our modern, U.S. facility and tested rigorously prior to shipping. Contact us today to speak with an engineer and learn more about our flame systems for plastic surface treatment.